The real joy is in the candy, but if the package isn't tasteful the candy may never be enjoyed. Show off the candy inside the package with clear candy packaging tubes. Clear packaging lets the consumer examine the product, with printing or labeling options to display all criteria for the treats enclosed. 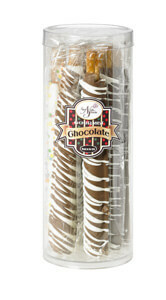 Our 10" long candy tube packaging containers include one end permanently sealed and a clear cap to secure the open end. Candy tubes and clear caps are sold together and are available from our online store. Custom inquiries are welcomed, with alternative cap options for consideration. Note: VisiPak currently does not provide tamper resistant shrink bands, click here to visit a supplier of various style shrink bands.